"The Bootcamp Bootleg is an overview of some of our most–used tools. The guide was originally intended for recent graduates of our Bootcamp: Adventures in Design Thinking class. But we've heard from folks who've never been to the d.school that have used it to create their own introductory experience to design thinking. The Bootcamp Bootleg is more of a cook book than a text book, and more of a constant work–in–progress than a polished and permanent piece. This resource is free for you to use and share – and we hope you do." "Why waste time on expensive experiments when the right answer is obvious? The flaw in this thinking is that creativity is an iterative process in which you synthesize the final result from a variety of sources and thousands of potential solutions. It is not purely a deductive process with a single right answer. When you fail to experiment broadly, you are building your solution from an anemic set of mental and technical resources. It is the equivalent of trying to design a bridge when the only material you've tested is paper. You can certainly build a bridge, but it will not be nearly as good compared to someone who experimented with a broad range of materials and construction techniques including steel or concrete." 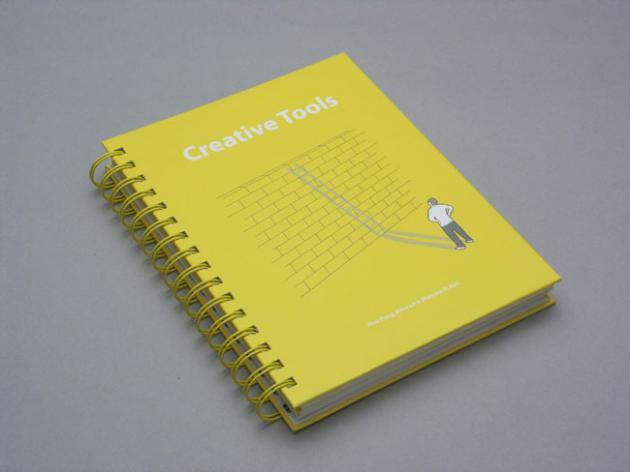 "Creative Tools was co–authored by Alex Fung, Alice Lo and Mamata N. Rao based on their teaching and students' learning experiences in the Design Thinking subject. Foreword by Dr. Edward de Bono, this handbook is a comprehensive guide to 15 creative tools that help develop students' creative thinking, not only for design by other disciplines. Each tool has an introduction followed by a demonstration of its use with reflection." Alex Fung, Alice Lo, Mamata N. Rao (2005). "Creative Tools", School of Design, Hong Kong Polytechnic University. "IDEO Method Cards is a collection of 51 cards representing diverse ways that design teams can understand the people they are designing for. They are used to make a number of different methods accessible to all members of a design team, to explain how and when the methods are best used, and to demonstrate how they have been applied to real design projects. IDEO's human factors specialists conceived the deck as a design research tool for its staff and clients, to be used by researchers, designers, and engineers to evaluate and select the empathic research methods that best inform specific design initiatives. The tool can be used in various ways – sorted, browsed, searched, spread out, pinned up – as both information and inspiration to human–centered design teams and individuals at various stages to support planning and execution of design programs. Inspired by playing cards, the cards are classified as four suits – Ask, Watch, Learn, Try – that define the types of activities involved in using each method. Each approach is illustrated by a real–life example of how the method was applied to a specific project. As new methods are developed all the time, the deck will grow and evolve over time. 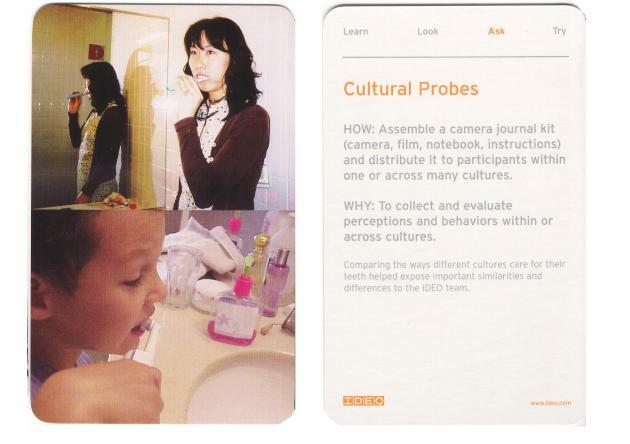 In its first year, the Method Cards appeared to have unexpected relevance to groups that are not necessarily engaged in design initiatives. Clients report using the tool to explore new approaches to problem–solving, gain perspective, inspire a team, turn a corner, try new approaches, and to adapt and develop their own methods."